We report the latest results from a Wellcome Trust-funded collaborative project between the University of Nottingham and the University College of London investigating OPM based multichannel MEG to be presented at the Workshop on Optically Pumped Magnetometers (WOPM ‘17). The image shows Elena Boto in a MEG helmet with 8 OPMs. The MEG helmet is 3D printed based on the subject’s magnetic resonance (MR) image. Elena Boto and coworkers at Nottingham report, “We have shown the ability to beamform sources to the motor cortex using a multi-channel OPM array, even when the subject’s head was unconstrained”. A multi-channel array comprising 8 OPMs mounted in a 3D-printed, head-shaped scanner-cast was used to perform OPM-MEG measurements. A single subject performed a visuo-motor task: 45 trials of left index finger abduction during the presentation of a vertical grating shown for 2s, followed by a 8s fixation period. The experiment was performed three times: once in the CTF system (SQUID) and twice with the OPMs (once with the scanner-cast fixed relative to the room (OPM-restricted) and once where the subject was seated, but able to freely move their head (OPM-free-moving). A) Time-frequency spectra of the three experiments showing the expected decrease in beta power during finger abduction (0-2 s window) and the post-stimulus rebound. B) Beamformer-reconstructed time series at the peak locations of beta rebound and decrease, and also at a location displaying no brain activation. Additional details can be found here in the Nottingham abstract submitted to WOPM’17. 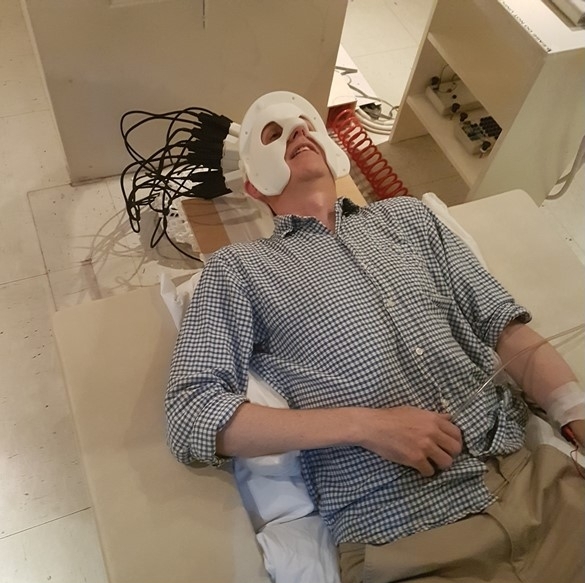 Prof. Gareth Barnes at UCL wearing a MEG scanner-cast with 13 OPMS positioned over somatosensory cortex. Tim Tierney and coworkers at UCL report, “We recorded data using a 3D printed scanner-cast containing 13 OPM devices positioned over the subject’s primary somatosensory cortex. 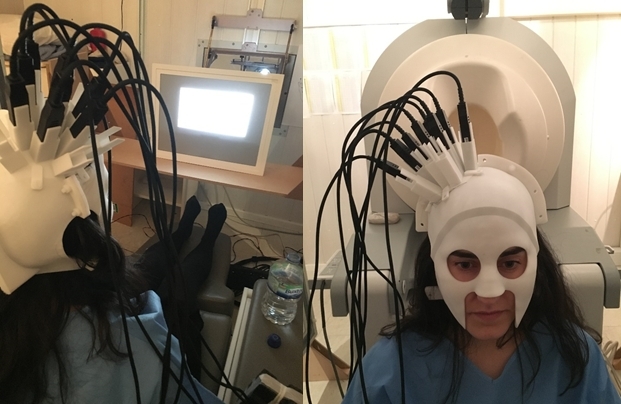 We made 13 simultaneous radial field measurements at 6.5mm offset from the scalp surface using QuSpin sensors within a mu-metal shielded room sited in central London with approximately 20nAm residual static field. 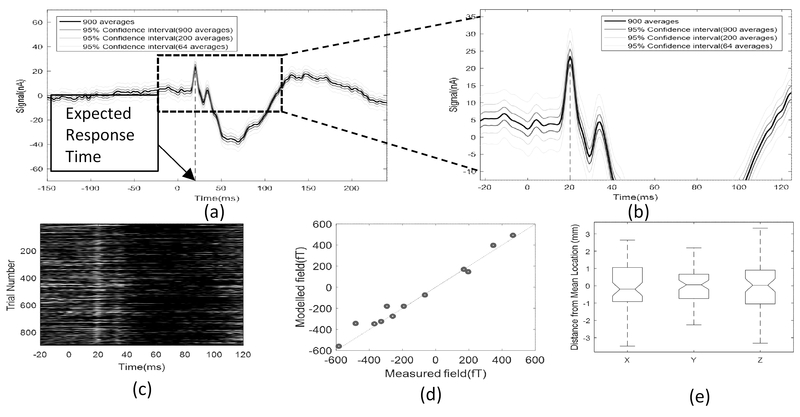 Data from 8 SQUID magnetometer channels were recorded simultaneously and used for reference noise cancellation. We used a non-linear optimization to explain the averaged recorded data using a single dipolar source. The localisation reliability was assessed using a bootstrapping procedure”. The authors further comment, “a single dipole fit was able to accurately model the measured field with standard error of ~7%. The mean location was estimated at coordinate (MNI): 50, -22, 46 in with variability ~ 2-3mm (Panel e) within primary sensory cortex. These results suggest that OPMs could provide accurate, reliable and cryogen-free clinically useful information”. In order to accurately obtain sensor locations and orientations with respect to the cortical anatomy the authors used a 3D printed helmet (or scanner-cast) built at Chalk Studios (http://www.chalkstudios.co.uk/) based on the subject’s magnetic resonance (MR) image. Additional details can be found here in the UCL abstract submitted to WOPM’17. Among other things, the focus is now on building a larger multi-channel array. The image below shows a picture of an MEG scanner-cast with 123 slots for a full head MEG system with 246 channels. QuSpin is working towards reducing the size of the QZFM sensors which will hopefully make the OPM-MEG system appear a little less intimidating.